As Austin's weather changes from autumn to winter; as freezing rain drips from the gutters and "that old north wind" blows the yellow leaves from our Texas ash, we mourn the tragic loss of Doobey, our precious black-and-white cat who died last night after a wild animal attack. She was buried this morning in our pet plot at the bottom of the back yard with her white catnip mouse, her knotty, psychedelic, drool-encrusted charmer, and a little mint-scented catnip "for the road." Doobey was a dear, sweet animal who brought peace to everyone in this life; may she find it now in her next life with her shadow companions, the boys, Brother Mercury, Brother Minx, and the ashes of Brother Jaffa. She is survived by Gris-gris and Possum who grieve today, seemingly sincere, along with their humans, at this sudden bereavement. We are all broken-hearted. As Doobey was a "pound cat," we knew little about her when we chose her nearly ten years ago. She was not photogenic -- her website picture suggested she might be a gang member -- but her charm on first meeting was irresistible. She was about six years-old and had been in the shelter for a while (probably because of that photo.) A homeless man had found and handed her in and it was thought she'd been abused because she was skittish and terribly timid. Despite this, she liked to play and adored tummy rubs, habits which she retained until the end. Doobey spent her first week under our bed, a refuge she took frequently over the years. She gave the impression that she didn't enjoy attention but once the barrier was broken, was forceful, nay, demanding in her quest for strokes, splaying herself before you, legs akimbo, so that "no" wasn't an option. She liked nothing better than to be brushed vigorously with a stiff brush for half-an-hour at a time. She wasn't really a lap cat but when the weather was cold and she selected you from a roomful of people, her unique method of "lap-sitting" involved wedging herself between your thighs and gripping with claws fully extended. This was a painful exercise. She had long claws. We will miss her claws. 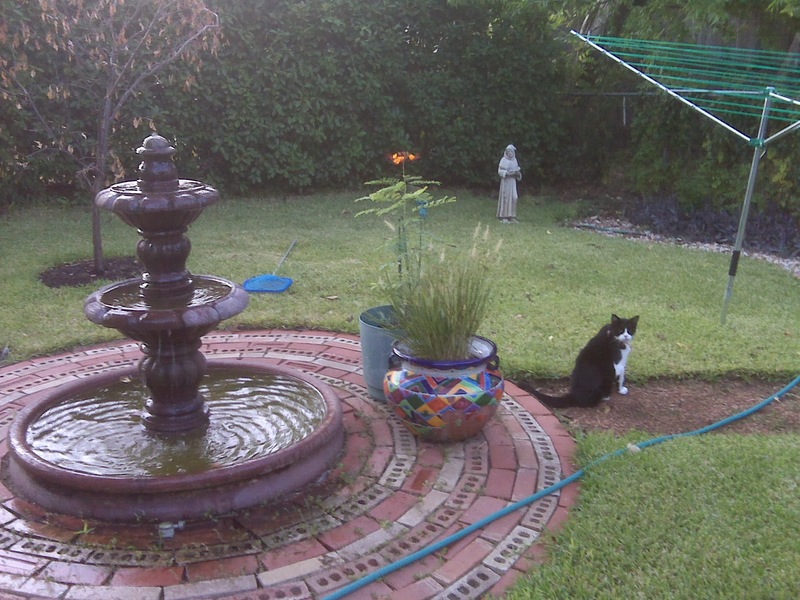 We'll miss her drinking out of a mud-filled birdbath instead of her bowl of fresh water. We'll miss her funny, waddling walk which didn't stop her catching a bird from the air. We'll miss her choosing only clean towels and sheets to sleep on, and springing out of the linen closet like a jack-in-the-box. We'll miss her black-and-white furriness on the black-and-white rug, so perfectly camouflaged that she could catapult a grown man across the room. It wasn't deliberate; she wasn't that kind of cat. Doobey was a back porch cat. We believe that cats, even pets, are essentially wild animals. We've always given ours the option to be "inside" or "outside" or a combination thereof. Some may judge us for this -- our vet was always irritated -- but Doobey hated to be indoors for long. She loved the outdoors, particularly the back porch, and though it proved to be her undoing, she lived contentedly, even blissfully, when the weather was good, on that porch for ten years. Oh, how we'll miss her presence at the back door, insisting on an open door but opting not to enter! We thank her for nurturing Jaffa during his short life; and for nurturing (read, tolerating) Possum, and teaching him some manners. 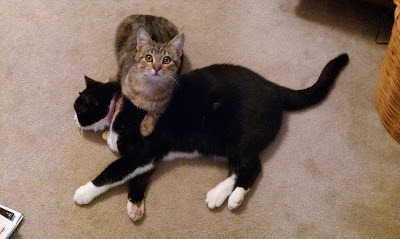 Just yesterday, he jumped on her back and knocked her over...she just licked his ear and walked away. That's the kind of cat she was. We thank God, the Universe and Suchness for bringing her gentle spirit into our lives. May that spirit always live within and around us.